The US government has raised serious questions about the origin of thousands of ancient artifacts being purchased for a Hobby Lobby-supported museum. 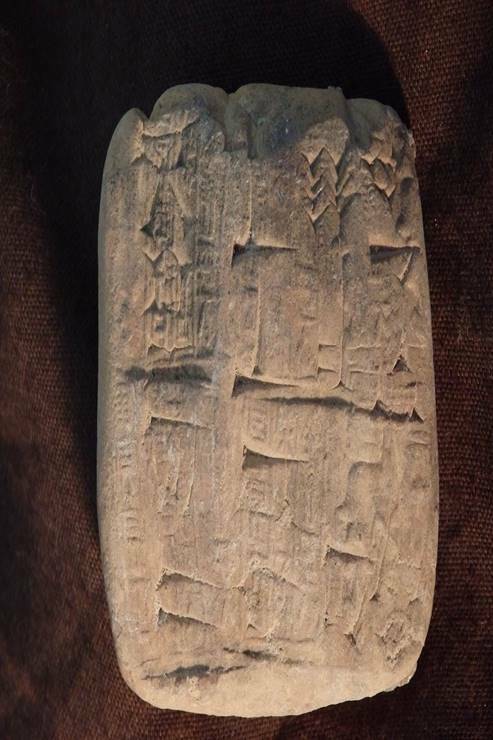 The case name alone is extraordinary: The United States of America v. Approximately Four Hundred Fifty (450) Ancient Cuneiform Tablets; and Approximately Three Thousand (3,000) Ancient-Clay Bullae. Those inanimate defendants refer to artifacts seized by US Customs and Border Protection officers in 2011 as they were making their way from the United Arab Emirates and Israel to the Oklahoma City headquarters of the arts and crafts retailer Hobby Lobby. As notes the civil complaint, filed yesterday, these objects were really smuggled into the country from Iraq, in shipments that falsely described some contents as tile product “samples” manufactured in Turkey. They are just a portion of the over 5,500 artifacts Hobby Lobby attempted to import following its purchase of them in December 2010 for $1.6 million, with the approval of its president, Steve Green. The government also filed a stipulation of settlement with the company to forfeit the artifacts along with 144 cylinder seals and an additional $3 million. It’s a not-so-super deal that Hobby Lobby should have anticipated: months prior to the illegal purchase, an expert on cultural property law had sent a memorandum to the company warning them that the objects may have been looted from Iraq and that their acquisition may carry high chance of being detained by US customs. This note, according to the complaint, was somehow received by an in-house counsel who had contacted the expert, but it was not shared with Green nor any parties involved in the objects’s purchase and import. Importing Iraqi cultural property into America has been protected by restrictions since 1990. At this point you may be wondering why Hobby Lobby, seller of baskets and home accents, has any interest in procuring ancient clay tablets and balls. As a press release explains on its website, the company began acquiring different historical Bibles and other artifacts in 2009 — slated to enter the Museum of the Bible, an institution spearheaded by Green that’s set to open in November, in the nation’s capital. The smuggled Iraqi artifacts would presumably have also entered this institution. “Developing a collection of historically and religiously important books and artifacts about the Bible is consistent with the Company’s mission and passion for the Bible,” the statement reads. Recall that this passion previously inflamed the nation in 2012, when Hobby Lobby filed — and later won — a lawsuit against providing employees access to birth control on religious grounds. Green was so drawn to the artifacts that he traveled to the UAE in July 2010 to check them out in person. Meeting him were two Israeli dealers and one UAE dealer, as the complaint describes, who showed him a collection of 5,548 objects ranging from cuneiform tablets and bricks to bullae to stone cylinder seals. These were displayed informally, according to the complaint, spread on the floor or covering a coffee table. One of the Israeli dealers provided a provenance statement noting that nearly all of them, aside from the seals, were acquired legally in the 1960s by another Israeli dealer’s father who bought them from local markets. The statement also noted that the collection had moved to the US in the 1970s, where it was under the care of a custodian in Mississippi. But Hobby Lobby, the complaint alleges, never confirmed the custodian’s involvement; this individual, in fact, apparently never stored the collection at all. As the complaint reads, “The acquisition of the Artifacts was fraught with red flags.” Still, Hobby Lobby forged ahead with the deal. Green, for whatever reason, wired the $1.6 million to seven personal bank accounts associated with five different people. Invoices falsely declare that the artifacts’ country of origin was Israel. Multiple shipments were then sent out, over a number of weeks, from the UAE dealer. He or she falsified invoices and shipping declarations to undervalue the individual contents so the total package wouldn’t exceed $2,000 — the value of goods subject to Customs’ formal entry process. Packages were also sent, with Green’s authorization, to Mardel, Inc. and Crafts, Etc!, which were then affiliates of Hobby Lobby and had neighboring offices. Officers made the first seizures in January 2011, stopping shipments in Memphis, TN. The approximately 450 tablets and 3,000 clay bullae in the case name refer to the contents of these shipments as well as objects that were later successfully delivered. According to the New York Times, the US government will post a notice online that provides 60 days for the artifacts’s owners to submit claims. Following that period, the Iraqi government can submit its own claim. Aside from the requirements of the settlement, Hobby Lobby will also have to adopt internal policies and procedures to govern imports and purchases of cultural property, properly train its personnel on such matters, hire qualified outside customs counsel and customs brokers, and submit quarterly reports to the government on any cultural property acquisitions it makes in the next 18 months. There may be greater scrutiny of its future actions, but this complicated debacle, of course, raises concern about the provenance of objects already set to go in display in the forthcoming Museum of the Bible. On its website, though, Hobby Lobby asserts that it supports every effort to protect ancient items and attributes what it describes as “regrettable mistakes” to sheer inexperience.